Y&S Condos is a new condo project by Tribute Communities and is currently in pre-construction. Y&S architect is designed by Graziani + Corazza Architects. The new project will be located at 2161 Yonge Street in Toronto. The major intersection is Yonge Street & Eglinton Avenue East. Y&S Condos will be a 36 storey tower with 288 mixed condo units. Units will consist of a mix of 108 one bedroom, 141 two bedrooms and 39 three bedrooms. 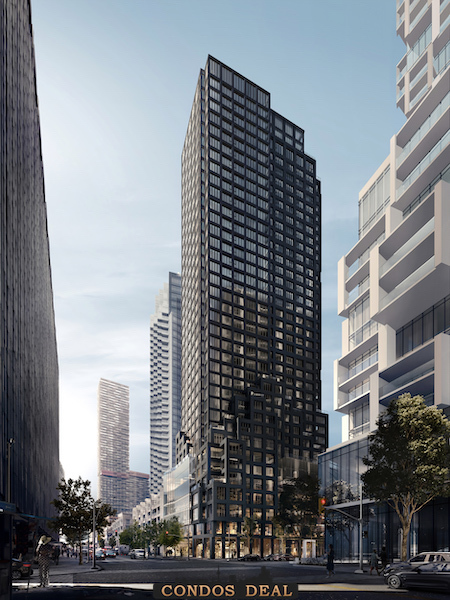 The estimated completion date for Y&S Condos is set for March 2023. The building will feature a double-height ground floor retail space. On levels 2 through 6 will contain offices. Residential Units will start on levels 7 through 36. Residents can enjoy indoor and outdoor amenity space on the 7th floor which will include a gym, party room with kitchen, lounge area, business lounge and children’s space. The building will also feature a four-level underground parking garage with 40 commercial parking spaces, 110 resident parking spaces, and 2 car-share spaces. Other projects by Tribute Communities are like 286 Main Street Condos, Humberwood Heights Towns, U.C. Towns 2, Towns at Rouge Valley, Max Condos, Imperial Square Condos, Stanley Condos, U.C. Towns, Varley Condos, and The College Condominium at Spadina.